NSF Project Report, 2009 - 2011. Adamick, J. (in preparation). Subject Repositories as Virtual Communities. Adamick, J. (2010). Ethics Day: Engaging Librarians in the Responsible Conduct of Research. Workshop Report. Amherst, MA: Ethics in Science and Engineering National Clearinghouse. Adamick, J. (2009). Literature Review as Call to Action: Addressing the Need for Evaluations of Subject Repositories. White paper prepared for Ethics in Science and Engineering: Redefining Tools and Resources workshop. Adamick, J., & Reznik-Zellen, R. (2010). Trends in Large-Scale Subject Repositories. D-Lib, 16(11/12). Adamick, J., & Reznik-Zellen, R. (2010). Representation and Recognition of Subject Repositories. D-Lib, 16(9/10). Adamick, J., Buchannan, E., Fountain, J., Gonçalves, M. S., & Proferes, N. (2010). Advancing Ethical Research Across Disciplines. White paper submitted to the National Science Foundation Social, Behavioral & Economic Sciences 2020 Project. Gonçalves, M. S., Fountain, J. E., Adamick, J., & Billings, M. (2010). Ethics in Science and Engineering: Redefining Tools and Resources. Workshop Report. Amherst, MA: Ethics in Science and Engineering National Clearinghouse. Adamick, J. (2010, December). Marketing a Small-Scale Subject Repository Through Collection Development. Poster session, 6th International Digital Curation Conference. Chicago, IL. Adamick, J. (2010, October). Subject Repository Development as an Act of Virtual Community Creation. Poster session, LITA 2010 National Forum, Atlanta, GA.
Adamick, J. (2010, October 20). Report on ‘Ethics Day: Engaging Librarians in the Responsible Conduct of Research.’ Research Libraries Council Meeting. Invited presentation. University of Massachusetts Amherst, Amherst, MA. Adamick, J. (2010, June 26). Subject Repositories as Virtual Communities. American Library Association Annual Conference. Poster session, American Library Association, Washington, D.C.
Adamick, J. (2010, March 26). 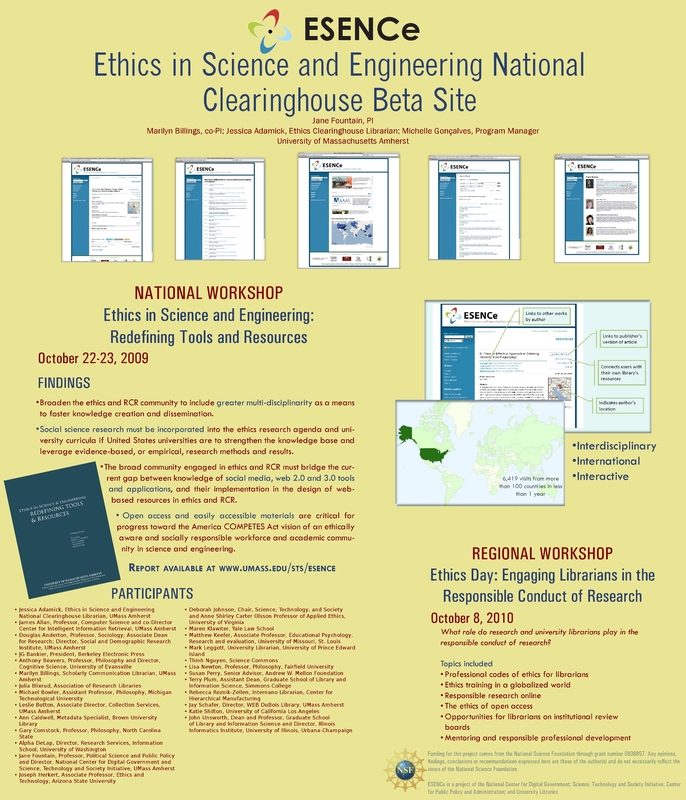 The Ethics in Science and Engineering National Clearinghouse Beta Site: Building a Resource for a Research Community. Western Massachusetts Health Information Consortium Meeting. Invited presentation. Holyoke, MA. Adamick, J. (2010, March 23). Making Teaching Visible: Using Repositories to Disseminate Grey Literature. Exploring New Options in Digital Publishing. NorthEast Regional Computing Program (NERCOMP), Amherst, MA. Adamick, J. (2009, October 28). Introduction to the Ethics Clearinghouse Project. Senior Management Group Meeting. Invited presentation. University of Massachusetts Amherst, Amherst, MA. Adamick, J., & Reznik-Zellen, R. (2010, May 21). Subject Repository Trends. Scholarly Communication Brownbag Series. University of Massachusetts Amherst, Amherst, MA. Adamick, J., & Reznik-Zellen, R. (2010, April 12). Generalizing the Subject Repository: An Investigation into Potential Best Practices. Spring 2010 Membership Meeting. Coalition for Networked Information, Baltimore, MD. Billings, M. (2009, October 2). ESENCe: The Ethics Clearinghouse, an Example of Partnering with Faculty on Externally Funded Grants, American Library Association, Library Information Technology Association Conference, Salt Lake City, UT. Billings, M. (2009, July 23). Evolving Models of Scholarly and Scientific Publishing. Association of College and Research Libraries, New England Chapter (ACRL NEC) Scholarly Communication SIG Workshop, Dartmouth College. Fountain, J. (2011, February 28). Ethics in Science and Engineering National Clearinghouse Beta Site. EESE PI Meeting, National Science Foundation, Arlington, VA.
Fountain, J. (2010, February 19). Expanding Ethics in Science and Engineering. Panel presentation. National Science Foundation and Ethics Education in Science and Engineering Workshop. American Association for the Advancement of Science (AAAS) 2010 Annual Meeting, San Diego, CA. Fountain, J. (2009, June 23). International Dimensions of Ethics in Science & Engineering. Invited presentation for the panel, Ethics in the International Context. NSF Civil, Mechanical and Manufacturing Innovation (CMMI) Research and Innovation Conference: Research in a Flat World, Honolulu, HI. Fountain, J. (2009, September 24). Creating Access to Knowledge: Ethics in Science & Engineering. Invited lecture. Fourth Annual Digital Quadrangle Series, UMass Amherst. Fountain, J. (2009, September 11). ESENCe and NSF Requirements. Invited presentation to the University of Massachusetts Amherst Research Council, Amherst.